In 2017 a new, inaugural event came to the Sunshine Coast and made a massive splash on the international stage, bringing in interest from around the world. 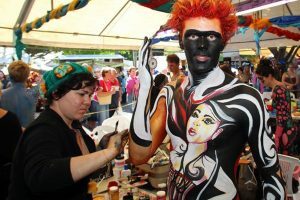 This year, this peculiar event is set to bring in thousands of visitors to the Sunshine Coast region all in the name of a single art form on the rise – Body Art. 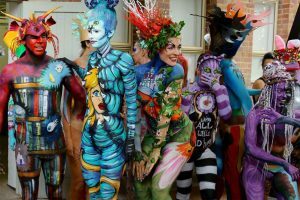 That’s right the Australian Body Art Festival is making a triumphant return this year with the full support of Tourism and Events Queensland. On April 7th and 8th come along to Cooroy and marvel at the incredible creations and performances on display this year, all under this year’s theme of “Wild Things” – from real world to fantasy, there’s no limit to where the artist’s creativity can take them. In total there will be five separate events spread across the two days of competition including a sponge and brush event, airbrush event, face painting event, special effects competition and finally the Bendigo Bank wearable art competition. On opening day things will begin to heat up from 8am as all competitors and their models must register for their individual competitions to be held on the first day – from 9am sharp artists may commence their brush and sponge entries, as well as the air-bush entries and will have until 2:30 to complete their masterpieces. At 9:30 the public will be allowed into the competitors marquee to be awarded the opportunity to watch the artists do their thing. At 4pm the Parade and Aware ceremony will commence, followed by the Saturday Soiree at 5pm. On the final day of competition registration will again be held from 8am sharp, followed by the Face Painting and Special Effects competition commencing from 9am. The Competitor’s Marquee will again be open to the public for viewing of the works from 9:30am. At 1pm the Cooroy Community Bank Branch of Bendigo Bank sponsored Wearable Art competition will be paraded onto the stage for it’s award ceremony, followed by the Face Painting and Special Effects having their own Parade and Award ceremony from 2:30pm. In addition to these competitions celebrating the fantastic work of the artists themselves, there will also be competitions for Best Model – one for each day, and a competition for best photographer across the two day event. Of course there will plenty of amazing street food and stalls of art supplies for those struck with sudden and incredible inspiration, and music and entertainment stretched across both days. For more information, registration and more, visit the Festival’s website and get musing.